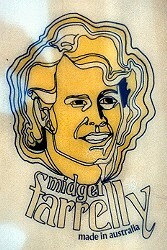 1971 Midget Farrelly Pop-out 5 ft 5 1/2"
set in blank and with no rovings. Deck: Large yellow/black illustrated portrait and 'Midget Farrelly' script, 'made in australia' black text. BOARD HISTORY: Purchased August 1997. 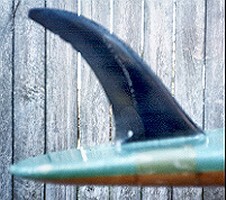 Note that like most mass-produced craft, most references in surf literature are derogatory. Note : The template of this board is untypical (strongly based on Ted Spencer's 'White Kite' 1969, See # 46) and the blank has been scored down the centre so that the laminating resin has filled it to produce a false glue-line stringer. #46 1969 Farrelly, Square tail 6 ft 4"
Vol 4 #4 Winter 1999 pages 50 - 61 - includes photographs .